The first danger of e-cigarettes is associated with the carrier product known as propylene glycol (PG). PG is primarily used in the production of polymers and in food processing. It can be found in various edible items, such as liquid sweeteners, ice cream, and whipped dairy products. It can also act as a carrier for various inhalant pharmaceutical products, including nicotine. PG is a viscous, colorless liquid that possesses a faintly sweet taste and is one of the major ingredients of the e-liquid used in e-cigarettes. When used orally, the breakdown products of PG include acetic acid, lactic acid, and propionaldehyde, which are all toxic to enamel and soft tissue. (4) In addition, PG is a hygroscopic product, which means water molecules in saliva and oral tissue will bond to the PG molecules, leading to tissue desiccation. (5) The result of this is xerostomia, or “dry mouth,” which has been shown to lead to an increase in cavities, gum disease, and other oral health issues. The final danger associated with e-cigarettes has to do with nicotine. Although the percentage of nicotine is much lower (0.3%–1.8%) than traditional tobacco products, one electronic cartridge (200–400 puffs) can equal the smoking of two to three packs of regular cigarettes. The dangerous effects of nicotine on gum tissue are well known. The literature suggests that nicotine affects gingival blood flow as it is a vasoconstrictor. It also affects cytokine production, neutrophil function, and other immune cell function. (7) In addition, nicotine decreases connective tissue turnover. All of this results a much higher chance of developing gum disease and tooth loss. For example, one patient of a general dental practice had a caries-free history for 35 years. He ceased smoking traditional cigarettes and decided to vape as he thought this was a healthier alternative. Within a year, cervical enamel demineralization and interproximal lesions were present on the mandibular anterior sextant, consistent with the primary point of contact of the e-liquid aerosol (figure 1). In another example, a young patient had been using e-cigarettes for five years. He started vaping as a method to quit smoking traditional tobacco products thinking vaping was a healthy alternative. Because of its ease of use, he smoked a cartridge of one of the more popular vaping products a day. Admittedly, he also drank energy drinks (high sugar content), stating that his mouth was often dry after vaping. 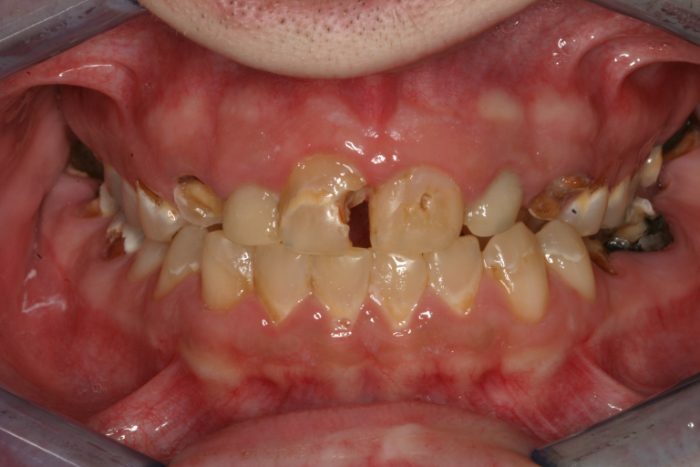 This combination led to rampant decay with smooth-surface lesions and future tooth loss (figure 2). Many advocates of vaping claim that e-cigarette use and vaping poses 5% the health risks of traditional tobacco smoking and claim its use to be helpful in getting people to quit. (9) This particular use does have merit and has helped many individuals quit smoking. Unfortunately, these studies have only analyzed e-cigarette use in former smokers using vaping as a way to stop smoking. The studies have not looked at the health effects of nonsmokers who start vaping because of the perceived innocuous health effects and because it “tastes yummy.” In addition, these studies have not looked at vaping in middle school and high school individuals, the group where e-cigarette use is increasing the most in percentage of use. Because of this, a tidal wave of oral health problems is heading our way.